The population of the Netherlands is two-faced. When we are among ourselves, we like to complain: about our politicians, the weather, taxes, the healthcare system, declines in fixed jobs, and immigration. In this year’s elections, parties with populist policies won over 25% of the vote. While we tend to be pessimistic about society as a whole, most people are very satisfied with their own lives. Despite our complaints, the Netherlands is one of the happiest countries of the world. Indeed, when we speak to foreigners, we paint a proud picture of our country. We speak of the Netherlands as a country that is hard-working but not too serious, innovative, well-organised, and with high standards of life. PM Rutte’s daily job is to tell Dutchmen they live in a ‘waanzinnig gaaf land’, which means something as a ‘madly cool country’. A Financial Times feature just before the elections broadly supported the claim. Indeed, if we look at the stats, it is fair to say ‘The Netherlands second’, as the viral video presenting the country to President Trump did this year did. Dutch economist Mathijs Bouman mapped the Netherlands’ performance on a range of indicators, comparing various rankings on competitiveness, innovation and human development. His conclusion? The Netherlands is the best country of the world, second only to… Switzerland. Only when the World Happiness Report was added, the Netherlands jumped over the United States to second place. With good scores on so many levels, it is time to reach the last frontier: make society even happier. And the Dutch are getting to business: over the last years, society’s happiness and alternative indicators have gained more attention in the Dutch public debate. Last year, the Dutch Parliament supported steps to create a ‘Monitor Broad Well-being’, to better assess quality of life in the Netherlands. Researchers and marketeers are also spending time on the topic. Recently, a study crowned the central Netherlands town of Ede the happiest city of the Netherlands. The Atlas of Municipalities, prepared with the support of the Happiness Research Centre of the University of Rotterdam, compared happiness levels in the 50 largest towns. Mid-sized towns like Ede, Apeldoorn and Gouda rank to the top, while most of the larger cities like Groningen, Amsterdam and The Hague are on the bottom of the table. Rotterdam, the second-largest city, even closes the list of 50. The map below outlines the top-10 in turquoise, and the bottom 1o in red. This map shows cities ranked 1-10 (in turquoise) and 41-50 (in red) in the Atlas of Municipalities. 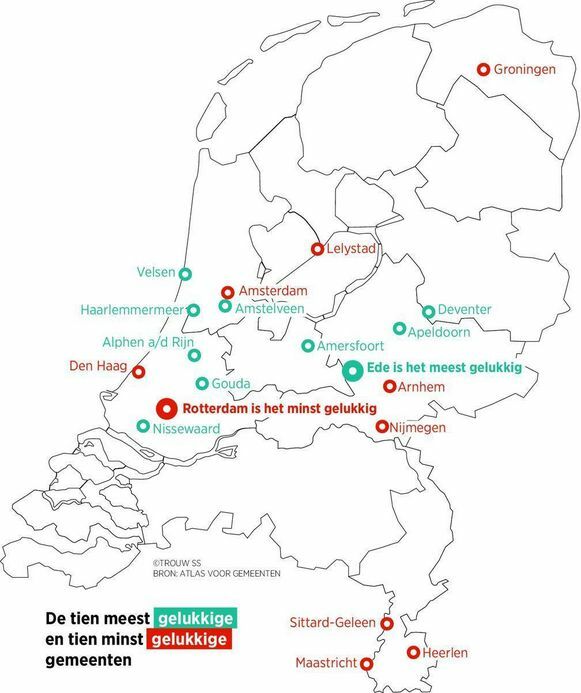 Source: Trouw, based on data of the Atlas. Let’s dig in a little bit deeper into what this all means. First of all, what is happiness anyway? For the purposes of the study, it is “the extent to which an individual find satisfaction in their own life as a whole”. ‘Happiness’ is then measured via three metrics: an overall judgement of a respondent’s life satisfaction as a whole, the extent to which one is a happy human being, and the extent to which one felt happy in the last four weeks. Ede overall scored best at this, with 89% of the local population scoring at least an average of 7 out of 10 among the three. Second, how is Ede different than others? The researchers identified seven factors that account for the differences in happiness levels across Ede and the other cities. These, include the size and composition of the population, the employment rate, health, religion, and the attractiveness of life in the city. That however doesn’t mean that Ede is the only city doing well on those factors, or on happiness. Overall, smaller cities tend to perform better than bigger ones: here, life is less chaotic, while there is more on offer than on the countryside. The differences between cities appear quite marginal and probably are not statistically significant. 17 out of the 50-sample score 88 or 89%, no fewer than 42 are in the 85-89% bucket, and even number last Rotterdam houses 82% of happy people. As such, the meaning of being ranked first, second, or even thirtieth, is fairly limited. Other indices in the Atlas convey this point even more. The happiness index is only an annual theme of the Atlas, which annually compares cities on a range of metrics. Some of these metrics are pooled into indices, for instance mapping ‘attractiveness’ and social-economic performance. The ‘attractiveness’ index aims to compare how attractive cities are as a place to live for the Dutch population. It looks at factors such as the jobs within range of the city, the share of owned and pre-war homes, distance to nature, and the culinary and cultural offer. The social-economic index, as the name says, looks at elements like employment, the population share on welfare and with low education levels, and the poverty rate. Both rankings offer a radically different overview than the happiness ranking: ‘Happy’ Ede finds itself back at the 15th place as for its social-economic performance. ‘Unhappy’ Rotterdam is found a more attractive place to live than Ede (respectively 17th and 22nd on the attractiveness index). The takeaway? Indices help to spot cities’ strengths and weaknesses, especially when you dig in the underlying data via the OECD-type dashboard approach the Atlas offers. But different measurements give different results. While it is fun to publish such rankings and see how our cities perform, one cannot a lot of value to small differences or annual movements in the Netherlands. And the key message remains that life in the Netherlands is good. We can be among 82% of happy fellow citizens, or among 89% in Ede. In this sense, the Dutch do live in a ‘madly cool country’, as Prime Minister Rutte said. For A State of Happiness is on off-season now, but just like with TV series, you can always watch back your favourite episodes. See below the index of the posts of season 3, 2015-2016. 7. Inside Out: our emotions make us who we are. Disney-Pixar’s move shows what happens if Joy and Sadness appear from our regulation of emotions. 17. Happiness, it’s not just your genes, stupid. Genes are important, but it’s not only genes that bring happiness. Far from it. 28. Seligman, a founding father of positive psychology. A quick look at the achievements of the man who realised that psychology shouldn’t only endavour to take away suffering, but also strengthen well-being. 12. The Unhappy States of America. We’ve seen three decades of decline in happiness in the US. Where did the great nation go wrong? 27. Realising the Bhutanese dream. My dream trip to the cradle of Gross National Happiness is becoming reality! 6. ‘It’s not easy to do the right thing’. GNH’s development is in full swing, and two other things I learnt at the Gross National Happiness conference in Bhutan. 20. GNH: 2015 survey finds 43,4% of Bhutanese are happy. … and of the results in 2015. 23. Happiness… at work! Check in for some details on my workshop on happiness at work. 2. Does GNH policy work? GNH sounds great, but does it work in practice? It’s not doing too badly in Bhutan, I learn. 15. Looking back at my experiences and achievements in 2015. Time to appreciate my learning over 2015. 4. Be Simply Happy 2016. No more elaborate schemes of New Year resolutions for me! 11. One million migrants and the island of all together. A documentary compellingly shows that refugees aren’t numbers, but people. 18. Soon, in a theatre near you… Advertising upcoming talks on Kim Kardashian and Nelson Mandela as models of happiness. 25. Keynes dream: how to get to a 15-hour working week by 2030. Is a shorter working week possible? 1. A human connection through layers of brown packing tape. My favourite (street) artist brings joy, light and love into my room. 22. Bruxelles ma belle. A tribute to Brussels at a day of mourning. 29. TEDxBrussels: doing good in the deeper future. TEDxBrussels theme was ‘Deeper Future’. For me, it was also about Doing Good. 6. Less is more: a minimalist life. An encounter with a minimalist taught me something about life. That seven pieces of underwear is a bit tight, for instance. 12. Too many chiefs, and no Indians: the case for a Junior Happiness Officer. Every self-respecting firm has a Chief Happiness Officer. Where is their team? 28. The Good Life: 75 years of research in five words. The longest academic study of happiness shows some simple messages. 22. The Pursuit of Happiness: A User’s Guide. Be dedicated, be aware, be curious: my three strategies to pursue happiness. 31. Does size matter: higher tax, higher happiness? The answer is yes: there is a correlation between larger states and citizens’ well-being. 8. Basic income. Is the utopian dream the road to happiness? 14. The Nanny State: repression or happiness? Are people unhappy in states’ with paternalist policies on tobacco and alcohol? I take a look at the mixed evidence. 22. The Netherlands’ first step to be a happiness machine. Dutch Prime Minister Rutte claims the state is not a happiness machine. A parliamentary report makes a first step to looking more seriously at well-being. 12. Summer, time of darkness. Meik Wiking’s TEDx talk has a strong message. Happiness isn’t everyone’s to share, and for lonely people, other people’s happiness can bring suffering. 23. The Social Progress Index: is your region better than its peers? The new SPI digs down to provide well-being data on the regional level. 27. A world beyond GDP: are we ready yet? In my concluding post, I explain why GDP is still out there, comfortable on its throne as primary indicator of progress. It’s almost August, time for summer holidays… or to catch up with some of the posts on For A State of Happiness that you may have missed? 3. People make life interesting. About an ephemeral encounter that taught me something about happiness. 8. Gross National Happiness – an idea whose time has come. I disagree with the Financial Times about the virtues of GNH. 29. … and your boss. … and it’s good for the employer, too. 6. Mojitos, lego and beyond: work and motivation. With the help of behavioural economist Dan Ariely, I look at the question what motivates us to work. 13. Walking in the sea. An adventure in the Wadden Sea. The feeling of bliss and accomplishment after four and a half hours of ‘horizontal alpinism’ is massive. 20. Beyond GDP, a long road to travel. The lessons of a European Commission conference on GDP and beyond. 27. When I am happy (Sunday, 13.44). Hint: a good coffee helps. 5. Happiness is a messy thing. Complex processes come into play to achieve happiness. 10. Crush your comfort zone and make the magic happen. Title says it, no? 17. My happiness bookshelf, work in progress. Follow-up from one year earlier: my shelf with happy books has expanded! 3. The power of negative emotions. Attending the Foro Bienestar happiness conference in Guadalajara, Mexico, I learnt about the force of the negative to power positive action. 8. Juggling yellow stress balls: my message at the Foro Bienestar conference. In my own speech, I suggested happiness is in measurement, a political agenda, and work-life balance. 16. Why are Mexicans so happy? Back from Mexico, I wondered why Mexicans are ranked higher than expected in the happy lists. 5. Balanced and ambitious goals – new years resolutions. My plans to become the better me. 11. Je suis Charlie. Five day after the Charlie Hebdo attacks, happiness bloggers should also stand for freedom of speech. 19. Celebrate blue Monday. Blue Monday is a myth worth to be celebrated. 26. ‘Privacy is theft’, a warning against invasive technology. Dave Eggers’ The Circle offers many pieces of wisdom on happiness and technology. 2. The Happy Danes: why are Danes so damn happy? A study from the Happiness Research Institute has some answers. 9. Happy maps. What if maps would help to lead us to happy places? 18. La Grande Bellezza & the ability to enjoy our lives. The great Italian movie renders (un)happiness visible. 9. Street art, a form of art to bring light to our streets. The creation of a piece of art on a wall near my house led to a special encounter with the artist. 18. Who’s responsible for your work-life balance? You! TED speaker Nigel Marsh puts the finger where it hurts. 23. How happy are we actually in Europe? Three days after World Happiness Day, I explore data on EU happiness levels. 13. Money – making sense of the root of all evil. A workshop on money as a ‘blank slate’ helps face me the question: what does money mean to me? 20. A $70k minimum wage. My comments about a US company’s policy to raise salaries to enhance staff’s happiness. 29. The World Happiness Report 2015: a wealth of data to make the world a happier place. It’s all in the title, no? 4. Smile! An eternal smile does (not) lead to happiness in this short film. 13. Happiness in the past, present and future. Psychologist Robert Biswas-Diener believes we can find happiness in our past. I disagree. 18. Social Progress, a better way to measure a good society. My favourite alternative indicator (Yes, I have one). 10. Can we replicate Denmark’s success story. … and identified urban design, work participation, and security (reduction of barriers to unhappiness) as factors to copy from Denmark. 15. Does happiness make good policy. Happiness is all about statistics. That is one of the insights I shared at an event by the Danish Embassy and YPFP. 8. Hope in the Greek crisis of happiness.As the news is full of the economic and political crisis, I look at a couple of stories with positive signs coming from Greece. 15. If urgent, be patient. That might be the idea to achieve a good work-life balance. 21. Spinach is not the key to happiness. And neither is Coca Cola. Happiness sells, also for coke and gin-tonics. Read all? There’s always season 2013-2014, and For A State of Happiness will be back in September. I am off in August, but don’t stress. There are over 40 posts on happiness in the season 2013-2014, so there must be something to catch up with. 7: A Happiness Bookshelf. Moving in my new apartment, I created a bookshelf with happiness books to make my house a happy place. 12: The manufacture of happiness. Together with my former colleague Maroussia, I wrote about how we can fabricate happiness – and it’s still authentic! 14: I do like Mondays. Mondays. They’ve a bad reputation, but I think they’re fine. Monday is my blogging day. 21: Matthieu Ricard’s plea for altruism. Matthieu Ricard is quite an interesting figure. A scientist, a monk, and arguably a happiness popstar? He now has written a book on altruism. 28: Never trust Einstein’s wisdom. There are great quotes on happiness all over the internet. But who said those words? 4: Teaching my smartphone empathy. Technology with ‘feelings’ can help us fight depression, according to Matt Dobson at TEDxBrussels. 11: The magic of TEDxAmsterdam: humour, flow, wit, passion and power. Title says it all, no? 18: Intense London Days. Title says it a little, no? 25: Costa Rica. The secret of pura vida. Why is Costa Rica so happy? Pura vida, mae! 2: Gratefulness brings happiness. Stop, look and go. Is there any happiness without gratefulness? 9: The optimal income for happiness. At what point is a higher income related to less, not more, happiness? 18: Curated by you. When friends send me great happiness links, my blog posts write themselves. 6: The lottery of happiness. When winning a lottery brings misery instead pleasure. 12: The Happy City. Lessons from Bhutan. Stadsleven organises a talkshow about happiness in Amsterdam. I wrote a post about what Bhutan and Gross National Happiness could teach the city. 20: Fitter, happier. Radiohead has a song about New Year’s Resolutions! 27: Utopia. In a Dutch TV show, fifteen people try to build the ultimate society. 3: The Happy City. After the Stadsleven talkshow, I share what I learnt about the design and social fabric of a happy city. 7: hAPPiness. A guest post by Sanne of Stadsleven on how iPhone apps and Twitter can measure our happiness. 10: The politics of well-being. Why are happiness and well-being so difficult for politicians? 17 : Gross European Happiness. In a guest post for YPFP, I challenge EU policy-makers to take up the challenge to make Gross European Happiness a reality. 24: The special power of music. Music = happiness. Clearly. 3: On waiting for traffic lights. I share some of my experiences after a great, great week at a course on the Economics of Happiness on the countryside of Devon, England. 19: 20 March, International Day of Happiness. The International Day of Happiness, lightened up by the International Hymn of Happiness: Pharrell’s Happy. 24: Russell Brand farts for revolution. Russell Brand’s show is about freedom and inspiration. And farts, and too close love for cats, too. 31: ‘Flow’, a real experience of happiness. On Mihaly Csikszentmihalyi’s TED talk about flow and happiness – probably my favorite. 7: Frohes Schaffen. On our identity as workers. 14: Tune in to radio. Announcing I joined a radio show, and giving some hints about questions on happiness I want to answer. 21: Condivivere - a neologism for ‘sharing life’ in Italian. That was what I took from the radio show! 28: Apart from Christmas time, the only day I skipped… Let’s say it was my Easter break. 5: Serious play & happy gin-tonics. I spent a Saturday trying to record an own version of Pharrell’s Happy. The efforts failed but it was fun anyway! 12: An EU Happiness Manifesto. I didn’t run for election, but wanted to inspire candidates for the EU elections. 19: Runner’s high: “the body of man is capable of much curious pleasure”. Or, the feast of completing the 20 kilometers of Brussels. Running, that is. 26: The EU elections. 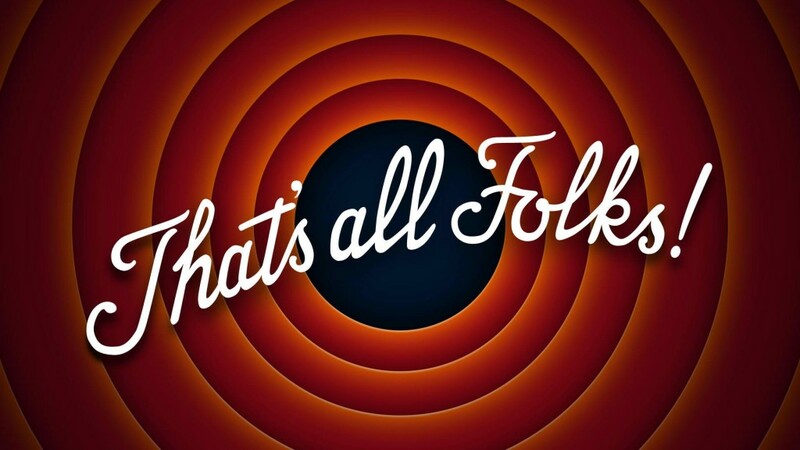 Taking a break from happy-blogging, I wrote about the ‘empty side’ of the European Parliament and the embarrassment in France after the EU elections instead. 2: The Independent’s Top 100 (of happiness, not of wealth). Personal stories about unknown people who make Britain happier, every day. 11: The Happiness Advantage: Shawn Achor has a conviction: being happy makes us more successful. 16: Van Persie, football & happiness. On the contribution made by a pass by Daley Blind and a header by flying Dutchman Robin van Persie to my happiness. 23: RFK: measure what makes life worthwhile. The background of the quote (courtesy Robert F. Kennedy) that made me question Gross Domestic Product and look for well-being as an alternative. 30: Where the life is good. On the benefits of regional, instead of national, well-being and happiness statistics collected by the OECD. How do you think Brussels is doing? 7: A feel good video to witness happiness. How a commercial for a Thai life insurer teaches us about happiness (I know, who would have thought!). 14: How will buy your happiness?. The old-age question: can money buy happiness? TED speaker Michael Norton helps me to answer: yes, if spent wisely, it does! 21: The morality of the market. With the help of philosopher Michael Sandel, I ask whether friends can be rented and everything can be bought. 28: On the road, the sequel. The discovery of happiness started in September. And in July, I summarise what I learnt before taking my holiday break. Enjoy the summer and see you back in September for the season 2014-2015!